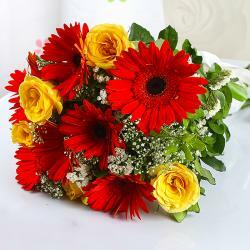 Product Consists: Bouquet of 15 Mix Colorful flowers like Bright Yellow, Red, Pink and Roses, White Gerberas with lots of green fillers. You will fall in love with this bunch of lovely fifteen flowers without a doubt. 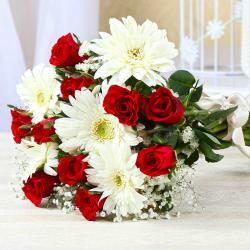 This bunch consists of fifteen flowers like roses and gerberas and has been immaculately packed in cellophane wrapping with a matching ribbon bow for company. The latter imparts added cuteness to this gift pack while the former is a nice touch for sure. 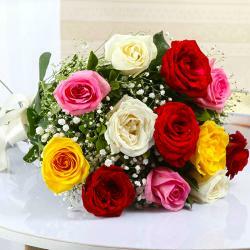 The lovely color of these flowers makes them a treat to behold instantly and every recipient will fall in love with this novel gifting pack for sure. This pack can be used on occasions like Birthday, Anniversary, Missing You, Ganesh Chaturthi, Boss Day. 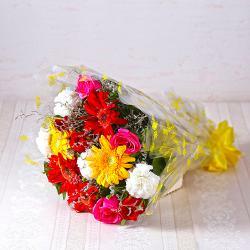 Product contains : Bouquet of 15 Mix Colorful flowers like Bright Yellow, Red, Pink and Roses, White Gerberas with lots of green fillers.